Though it's hard to find tech stocks that meet Berkshire Hathaway's standards for predictable cash flows and strong moats, these firms arguably fit the bill. Despite recently revealing that he'd bought 75 million more shares of Apple in the first quarter, there aren't many tech companies that one can imagine Warren Buffett and the rest of Berkshire Hathaway's (BRK.A - Get Report) investment team taking a close look at, given their investment philosophy. But exceptions do exist. The reasons behind Buffett's historical aversion to investing in tech are pretty well-known: He prefers to invest in companies with relatively stable and predictable cash flows, and is wary of firms whose top and bottom lines risk being upended one day by technology trends. Throw in Berkshire's preference for companies with simple business models, strong management teams, powerful brands and healthy pricing power, and the number of tech companies that potentially meet its criteria really starts to look small. However, Berkshire has nonetheless made several tech bets in recent years. Apple (AAPL - Get Report) , which meets plenty of Berkshire's traditional criteria and has some things in common with other high-profile consumer brands it has invested in over the years, such as Coca-Cola (KO - Get Report) , Gillette, etc. ), is perhaps the most well-known example. This column has been updated from May 4 to discuss remarks made by Buffett at Berkshire Hathaway's 2018 annual meeting. Last week, CNBC reported that Berkshire bought 75 million more Apple shares in Q1, taking the firm's stake in the tech giant to about 4.8%. And Buffett sung Apple's praises during Berkshire's annual meeting on Saturday, backing its new $100 billion share buyback plan and noting he'd be willing to increase Berkshire's stake even further if Apple's shares fell. "Apple has an extraordinary consumer franchise," he said. "I see how strong that ecosystem is, to an extraordinary degree...You are very, very, very locked in, at least psychologically and mentally, to the product you are using." Apart from Apple, Berkshire also maintains positions in domain name registrar Verisign (VRSN - Get Report) and insurance risk analytics leader Verisk Analytics (VRSK - Get Report) . And for a long time, Berkshire had a sizable position in IBM (IBM - Get Report) . However, the IBM position had been mostly liquidated by the end of 2017, as Buffett & Co. lost faith in Big Blue's turnaround efforts. 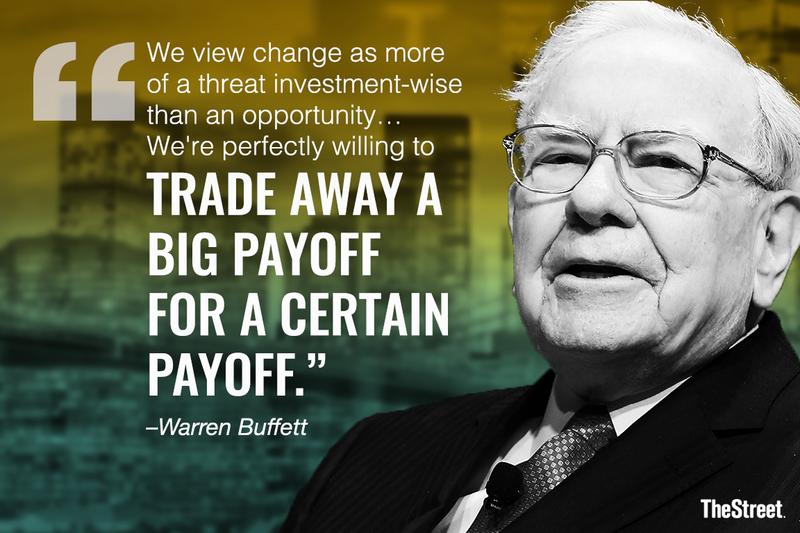 In an interview with CNBC that aired on Friday, Buffett said Berkshire had completely sold off its IBM position. 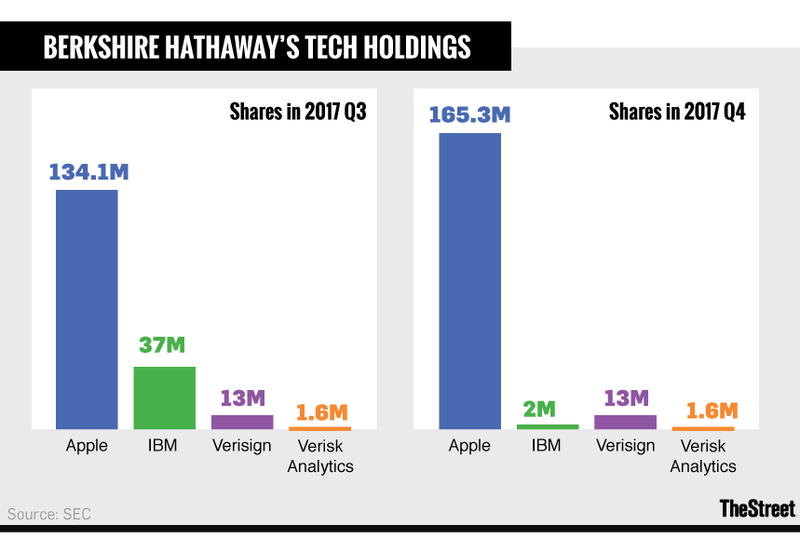 Given the extent to which parts of IBM's business were vulnerable to technological disruption, this was perhaps a case of Berkshire extending outside of its comfort zone. Here are three tech names that Berkshire hasn't invested in, but which arguably fit with many of its traditional investment criteria. This is a company that Buffett and Charlie Munger have openly voiced their regrets about not having invested in. At this year's annual meeting, Buffett reiterated he erred by not investing in Alphabet/Google (GOOGL - Get Report) , while adding the same held true for Amazon.com (AMZN - Get Report) . In each case, he blamed a limited understanding of the businesses and a failure to appreciate their long-term value. "I made the mistake in not being able to come to a conclusion where I really felt that at the present prices that the prospects were far better than the prices indicated," he said. At the company's annual meeting in 2017, Munger said that "I think we were smart enough to figure out Google -- those ads worked so much better in the early days than anything else -- so I would say that we failed you there...we were smart enough to do it, and we didn't do it." As Munger suggested, Google's core search ad business remains a one-of-a-kind Internet franchise -- a natural monopoly in what remains the most lucrative corner of the online ad world, and one that's backed by a consumer brand powerful enough to have become a verb. And as Alphabet's Q1 results show, it's a business that still has a lot of room to grow as mobile search activity swells and more ad dollars move online. Via YouTube, Google also has something close to a natural monopoly in ad-supported online video. And with its shares having slumped in recent months, Alphabet's valuation looks pretty reasonable, particularly considering its near-term profits are depressed by aggressive spending. The company has an enterprise value (market cap minus net cash) equal to 18 times its expected 2019 free cash flow (FCF). Though individual products within its lineup face competition from the likes of Adobe (ADBE - Get Report) and Siemens, Autodesk (ADSK - Get Report) is without a peer in the broader market for design and modeling software for industries such as construction, engineering and entertainment. And much like Adobe and Microsoft (MSFT - Get Report) , Autodesk is finding that transitioning users of its core franchises from licenses to subscriptions is both making its business more predictable and increasing its long-term revenue opportunity with major clients. Though this business model shift is weighing on near-term earnings and cash flows, Autodesk is projecting it will achieve $1.4 billion in FCF in fiscal 2020 (ends in January 2020), aided by 18% compound annual subscription growth from fiscal 2016 to fiscal 2020. And analysts expect $1.6 billion in FCF in fiscal 2021. That makes a current enterprise value of $28 billion justifiable, even if it isn't dirt cheap. Though quite a lot has changed in the consumers tech landscape over the past couple of decades, Dolby's (DLB - Get Report) brand still remains synonymous for many consumers with high-quality audio experiences. And together with a strong patent portfolio, limited competition and investments in new audio and video tech solutions such as Atmos, AC-4 and Dolby Vision, this has allowed Dolby's core licensing business to deliver steady, if unspectacular, growth in recent years. Dolby's Products business, which includes its Dolby Cinema systems for theaters, has also been seeing moderate growth. And thanks to a flurry of licensing deals with PC, mobile and game-console OEMs, the company is much less dependent than it once was on TVs, DVD players and home theater systems. Dolby has an enterprise value equal to 17 times its expected fiscal 2019 (ends in Sep. 2019) FCF. Jim Cramer and the AAP team hold positions in Apple, Alphabet, Amazon and Microsoft for their Action Alerts PLUS Charitable Trust Portfolio . Want to be alerted before Cramer buys or sells AAPL, GOOGL, AMZN or MSFT? Learn more now .